I have not shot a buck for the last three years, passing on the little bucks in hopes of a big one after 54 years of hunting. On November 21, 2012, I got my chance. My hunting buddy for the last 30 years died a couple of years ago from cancer. Hunting just wasn't the same without him. But, a couple of younger guys wanted to hunt with me and had the same deer management philosophy that I have. And, they promised they would help drag out any deer that I might get. That's important for an almost 70 year old! I was sitting in the stand that we call "Chuck's Stand" as it was my old hunting buddy's favorite. He even had a gun rest made for the stand for us old guys who aren't as steady as we used to be. This stand overlooks a picked bean field and food plot that I plant every year. During the afternoon hunt, a small buck came out of the brush and started feeding along the edge of the bean field about 30 yards away. He would look up every now and then in the direction that he came from. Sure enough, after a few minutes another small buck came out and started feeding toward the first buck. They started a half hearted sparring match which they soon quit and went back to feeding, but both bucks kept glancing occasionally in the direction they had come from. Then I saw what they had been looking at. Out of the brush, about 35 yards away, stepped this nice big buck that I knew immediately was a "shooter". I pulled the gun up and laid it on the gun rest, but in doing so I alerted the two smaller bucks who immediately jumped back into the brush. They were closer to me than the big buck and I must have made some noise that they heard. I don't hear well but the deer sure do. The big buck took two quick leaps and stopped just at the edge of the brush, just long enough to give me a quick shot. I put the crosshairs right on his front shoulder and pulled the trigger. He imediately jumped into the brush and was gone. I didn't get too excited because I have shot a lot of deer in my lifetime. However, I couldn't wait to get out of the stand. I told myself, "Just relax and wait a few minutes." After about 10 minutes I could wait no longer, so I climbed down and walked over to where I last saw him jump in the brush. It was getting near dusk so the light was not great for looking for blood. I looked very carefully for a few minutes not seeing any blood. So I deceided to go to my truck and get a flashlight. I was very disgusted with myself, thinking that I must have missed him. After getting the light and returning to the spot where I last saw him, I started looking for blood again and wishing there had been snow on the ground, as all hunters wish for when tracking a deer. While looking at leaves of many colors, it was hard to see blood. But, after searching for a few minutes, sure enough there was a small spot of blood. Then nothing. I walked in the brush for a few yards looking for more sign, still nothing. Not wanting to push the deer, I decided to wait until morning and get some help. I tied my hankie to a branch where the blood was and left. I tossed and turned all night, waiting daylight. I had gone to bed early and, when I got up, I checked my cell phone for a message from the young man that hunts with me, but he had not left one. It was Thanksgiving morning so I was wondering if he was going to hunt. At 5:30 a.m. I called him. After a few rings, he answered with a sleepy voice and a baby crying in the background. It was obvious that I woke up the whole house. When I asked if he was hunting, he said that he was going to go behind his house because he could only hunt for a short time because they were going away for the day. I told my tale of woe and asked for his help, which he offered gladly. We met at 6:30. It was still pretty dark so we planned to take our stands until 8 a.m. when we could see better before searching for the deer. I got into Chuck's Stand, waiting for first light. Slowly, the morning light grew. Having sat in this stand a few times during bow season, I was familar with most of the logs and bushes. I noticed what I thought was a new spot out in the brush, but could not really tell what it was. By 7:30, I could take it no more. I decided to get out of my stand to check out what I thought I saw in the brush. I called my hunting buddy on my cell phone (great invention!) to tell him I was getting down to look for blood where I last saw the deer the night before. I walked to where my hankie was tied to the branch, but kept thinking about that spot in the brush. I got there and looked out in the brush, nothing. I took a few steps into the brush lot and looked up again and there he was, about 40 yards away. I could tell he was dead by the postion of the body. I went over and rolled over his head and started counting points, looking at an incredible, great spread. I called my buddy to tell him to come help me drag out my "buck of a lifetime." When he arrived, we rolled the deer over and he said "You got Patches!" Sure enough, it was the buck that I had videoed during bow season that had a rub spot on his back. I emailed my deceased hunting buddy's wife about shooting the buck of my lifetime from "Chuck's Stand". I am sure he was there with me that afternoon making sure the shot was true. My memories of that day will last me the rest of my life. The best Thanksgiving ever!! 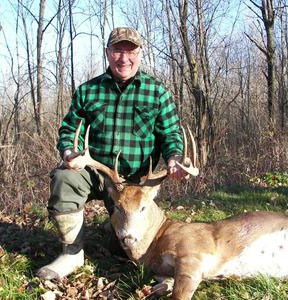 The Seneca County buck wieghed 170 lbs field dressed with a 24 inch outside spread and 10-points. The taxidermist green scored him at 149 before deductions, but should end up around 145. Life of good.